1. Remove any tough outer or damaged leaves Cut off stems and tear leaves into large pieces. Wash in sink filled with cold water. 2. Place broccoli rabe in a deep sauce pan with cold water to cover by 1 to 2 inches. Bring just to simmer over high heat. As soon as bubble appear at the sides of the pan remove from heat. 4.Immediately place broccoli rabe in cold water to cover to stop the cooking process. When broccoli rabe is cool, drain well in a colander and pat dry. 5. Cover with a damp cloth and refrigerate until ready to sauté or add to pasta or sauces. 1. Heat oil and stir in garlic in a large sauté pan over medium heat. Add the sausages and sauté until meat is cooked and loses its raw look. Salt and pepper to taste, sauté one minute. Add the rabe water. 2. Raise heat and cook until sauce is hot. 3. Meanwhile, cook orecchiette in rapidly boiling salted water until al dente. 4. Drain orecchiette. Return drained orecchiette to the pot. 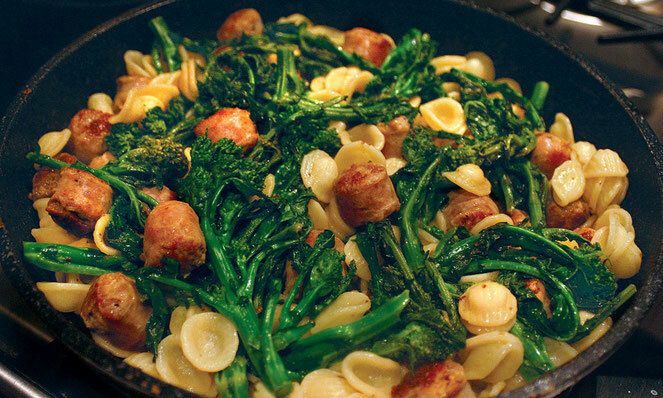 Place over medium high heat and stir in 3/4 cup of broccoli rabe and sdausage sauce. Using wooden spoon, toss together for 1 minute. Remove from heat and pour into a large serving platter or bowl. Spoon remaining sauce over the top. Sprinkle with Pecorino Romano cheese.